This entry was posted in canada day, canada day quilt by Norma Hanson. Bookmark the permalink. Wow, that was fast! I hope to get my green double four patch quilted in the next few weeks. I’ll finish the binding on my patriotic quilt when I get home and then it will go to Quilts of Valor. Very nice Canada Day quilt. Thanks for the instructions. I saw the newscast tonight about the Canada quilt for HIV/AIDS in Africa. It was a good story, lovely quilt. I saw Stephen Lewis speak at the last BCNU conventions in Vancouver. He was amazing to listen to – and very dedicated to Africa and the children there. A very inspirational speaker. Great quilt – you sure are fast! I love red and white together. Oh my goodness, Norma, you were really fast with that top!!! Love it! And thanks so much for sharing your dimensions and cutting sizes with us. This is perfect for Canada Day! Hurray for strip piecing for those 4 patches and 16 patches. Two color quilts are so striking, aren’t they? I have a pattern for something 2-color that I would like to do posted above the pressing/cutting table for inspiration—old clipping from an online spot. Does it go in the frame next? Nice Canada Day quilt. I’m working on a red/tan/blue one myself! 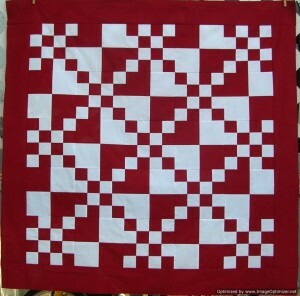 Red and white quilts are so crisp looking and this one makes a perfect Canada Day quilt. What a grgeous red and white quilt. So simple, yet so stunning. I love it – a perfect quilt for Canada Day! very nice quilt for yourself Norma-way to speedily piece this top! Can’t wait to see how you quilt it. That looks great – so dramatic. Red and white or blue and white always make wonderful quilts, I think. And so fast! I Love red! Great looking quilt, Norma! This is a great quilt Norma. I should make a doll quilt like that. I liked your circles on your customer quilt too. It does look like a lot of work, but hopefully it was worth the effort for you too. How do you tie off the threads? Do you leave them long, and then use a needle to hide them? Nice! Someday (on my list of things to make) I want to do some irish chains – but I like the diagonal effect of this too. A great quilt and perfect for our birthday!